Tart Montmorency cherries have been reported to contain high levels of phytochemicals that produce a wide array of benefits. Now those benefits extend to boosting melatonin, a molecule critical in regulating the sleep-wake cycle in humans. 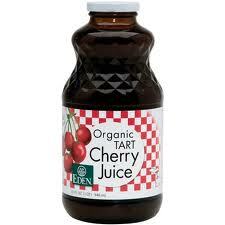 A group of people were given tart cherry juice in the morning and again before bedtime. There were significant increases in time in bed, total sleep time and sleep efficiency total with cherry juice supplementation. The results suggest that consumption of a tart cherry juice concentrate provides an increase in exogenous melatonin that is beneficial in improving sleep duration and quality in healthy men and women and might be of benefit in managing disturbed sleep. Other benefits have been seen for tart cherries including reduction in symptoms of gout, reduction in circulating inflammatory markers, pain relief after long distance running, reduced oxidative stress, improved recovery following exercise induced muscle damage, and improved sleep quality in late life insomnia. It appears that the phenolic compounds in the cherries act as free radical scavengers that reduce oxidative stress. The anti-inflammatory properties of tart cherries appear to rival those of noon-steroidal anti-inflammatory drugs. Cherries are high in protective phytonutrients called anthocyanins.